While our Scottish travels take us far and wide, they rarely afford us the opportunity to linger long in a place. 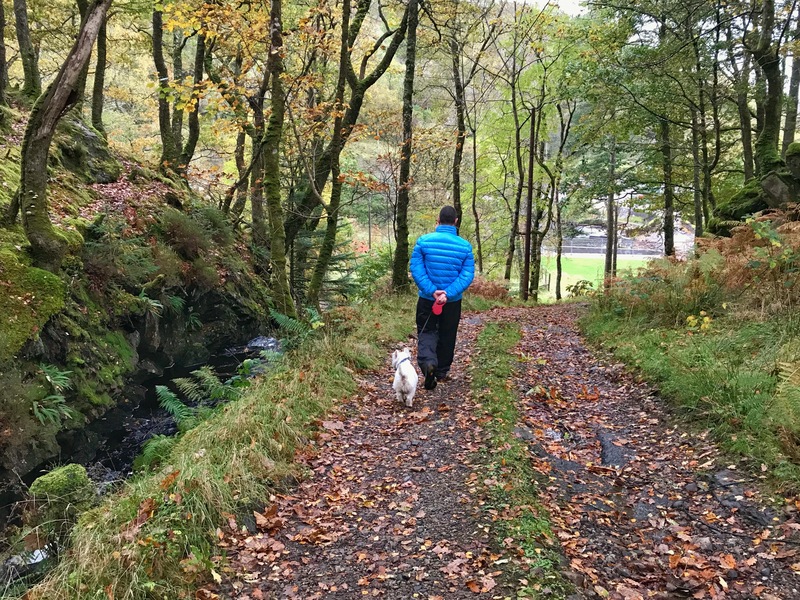 So, when I was invited to enjoy a taste of autumn, winter and spring on the Ardtornish Estate in Morvern I jumped at the chance. Three opportunities for a spot of self-catering in the Scottish Highlands – what could be better? Leaving Edinburgh behind we set off to embark on our first Ardtornish Estate adventure. We drove north via the A82, passing through an atmospheric looking Glencoe. The traffic en route was fairly busy – not what we’d expected, considering it was a dreich (miserable) October afternoon. That would change once we crossed the Corran Ferry and reached the blissful, quiet roads of Morvern. The dreich weather on the other hand……. The final leg of our journey took us along the A884 – a stretch of single track road where the only traffic jam you’ll encounter will be sheep on the road. The A884 is where I first spotted a Golden Eagle in the wild, many years ago. I remember watching, spellbound as it soared high over the hills. As we neared our destination I noticed an odd wailing sound in the car. I looked everywhere, trying to work out what it was before realising a strip of freshly laid tarmac on the road was causing the wailing! You may think a stay on a Highland estate would be expensive, but at the Ardtornish Estate a bed in the Bunkhouse only costs £23.50 per night. We stayed in a one bedroom studio in the Bunkhouse which costs £75 per night for two people. Our accommodation was comfortable and well equipped. It had a lounge/kitchen, double bedroom and en-suite shower room. French doors in the lounge led to an enclosed, back garden with patio furniture – perfect for al fresco dining on a warm evening. Once we’d unpacked, we headed outside to begin exploring the estate. Our first stop was to admire the ‘big hoose’ – a grand Victorian mansion which stands in a beautiful garden. The ‘season of mists and mellow fruitfulness’ was in full bloom. We wandered round the garden exploring paths and snapping photos. Surrounded by newly fallen autumn leaves the boy was in his element. Progress on our walk was slow as he insisted on stopping constantly to sniff – no leaf was left unturned. He’s obsessed with autumn leaves and loves to trample through them with his nose to the ground. Realising we’d need to get the boy away from leaves if we wanted to get any walking done, we headed to Loch Aline for a walk along the shore instead. It was a lovely walk – scenic, tranquil and despite the estate’s accommodation being fully booked that weekend we didn’t meet another soul. We spotted a solitary heron hunting for fish and high overhead, a pair of eagles soared. Without leaves to distract him the boy’s pace picked up. From time to time he caught a scent in the air and stopped to sniff. He has a great nose for sea creatures and never misses a seal. We suspect he’s also good at picking up otter scents but we’re never lucky enough to spot them. The rut comes to the Ardtornish Estate! That evening we dined on a buffet of cheeses, meats and savoury treats from good old M&S. I lit the fire, as for some reason Mr G lacks the caveman fire building gene that most men seem have. Me on the other hand, I’ll feed a fire with logs, kindling and scrunched up newspaper all night long. We spent a relaxing night blethering (Scots for chatting) by the fireside as we drank two of Scotland’s finest gins – Rock Rose from Caithness and Arbikie’s, Kirsty’s gin from Angus. We ended the night with a whisky liqueur from Old Pulteney, a distillery based in Wick. Stroma is a delight – made with honey and malt whisky, it makes the perfect nightcap. Before bed I decided to get the boy out for a quick wee. Popping his retractable lead on I opened the back door and off he disappeared, into the night. I was feeling pretty smug at my ingenuity when a loud bellowing sound made me shoot ten feet into the air with fright! Quickly reeking the now barking Wee White Dug inside, I slammed the door shut. “What in hells name was that?” I asked, before the penny dropped. It was October and rutting season was in full swing. The bellowing beastie outside was a stag trying to attract the ladies. That night I struggled to sleep through a cacophony of bellowing, barking and shouts of “shut up Casper” – it’s hard to say which was most annoying but Mr G and Casper were way up there! Despite the nocturnal noise we woke feeling fresh, and raring to go. After a quick Continental breakfast we were on the road. Before leaving the estate we stopped for a closer look at Kinlochaline Castle, a restored 15th century tower-house which sits at the head of Loch Aline. The terracotta coloured castle blended perfectly with the autumnal scene surrounding it. It was a mild, dry morning but rain was forecast to arrive in the afternoon. We decided to make the most of the dry spell and get some exploring and walking done before the heavens opened. We headed to the nearby village of Lochaline. The loch-side village is one we usually shoot through, going to or coming from the Isle of Mull. A regular ferry service operates between the village and Fishnish on Mull. On the other side of Loch Aline we could make out the ruins of Ardtornish Castle silhouetted against the skyline. A ferry was due and Screen Machine, Scotland’s mobile cinema which serves remote regions was waiting to cross to the island. Reading an information board about the village my attention was drawn to a section on Kiel Parish Church, and an impressive collection of medieval grave-slabs housed there. I was excited but Mr G didn’t share my enthusiasm. I LOVE medieval gravestones, and the stone of a clan chief or holy man sends me into raptures. Luckily Kiel was only a short drive away. The current church is late 19th century, but in the churchyard lie the ruins of a medieval chapel, built on the site of an even earlier chapel St Columba was thought to have a connection with. Mr G’s mood worsened when I led us through boggy grass to reach the ruin. Our trail shoes were soaked through. “No one forced you to follow me” I snapped. Next to the modern church, a restored 18th century cottage houses the stones. The collection of mainly 14th to 16th century grave-slabs had intricately carved designs with swords on them, but a couple had the wee holy men that I love – I was in my element. One stone had three swords on it. There’s only one other known example of its kind in Scotland. Others had clearly been recycled and bore 18th century names and dates. They reminded me of the stones on the Isle of Iona, so I wasn’t surprised to read that some were attributed to the Iona school. Whatever their origin, it was clear that these were not the gravestones of ordinary men. These were men of standing, and Kiel was obviously a burial site of great significance. Mr G was now complaining about wasting a dry morning looking at stones instead of hiking, so we left with soggy feet and a frosty air between us. Six miles from Lochaline, the Rahoy Hills Wildlife Reserve seemed like as good a place as any for us to embrace the great outdoors. Wet footwear swapped for waterproof boots, we set off along a tree-lined track, which skirted the side of a deep gorge, before meandering up into the hills. It was unseasonably warm so I took my fleece jacket off and tied it around my waist. Tee-shirt weather in mid-October was not what we’d expected. The path was good underfoot, making our progress easy. As soon as I vocalised that thought out loud it all went horribly wrong! Not only did it start to rain 2 hours and 40 minutes before it was forecast to, the path suddenly became a yucky quagmire. Rain and mud wouldn’t beat us though. We popped on our waterproof jackets and carried on, stepping more gingerly as we went. The rain got heavier, and we quickly regretted not having wrestled our waterproof trousers on too. Then I made an epic bog jumping miscalculation, and watched my right leg sink shin deep into mud. I could tell Mr G was dying to laugh. Admitting defeat we trudge back to the car, dripping wet and cursing the idiot weather man. The boy tried to shake himself dry but his efforts were futile. Back at the car I wrapped the boy in his towelling drying robe, and we cranked the heating up full for our drive back to Ardtornish to change clothes. We’d planned to eat in Strontian that evening, but the thought of a 36 mile round-trip in the pitch dark put us off. Not only would we have to wind our way through the mountains, we’d also have kamikaze sheep and bellowing stags to contend with. Plus when you factored in wailing tarmac it wasn’t a journey either of us fancied making, so we drove to Strontian for lunch instead. We enjoyed a take-away from Cafe Sunart. My lasagne and chips were the perfect choice – stodgy and comforting after getting soaked to the bone. We had coffee and cake too, figuring we deserved it after our hike. Mr G grudgingly went halfers, handing me a piece of his lemon drizzle in return for half of my chocolate brownie. We tried the brownie first and I instantly regretted my decision to share it. It was warm, gooey and tasted like heaven. The lemon drizzle was lovely but I’d clearly won the battle of the cakes, and unwittingly given away half of my prize! After driving for a while with no rain we deemed Camas nan Geall (Bay of the Strangers) a good place for a short (and hopefully dry) walk. It’s a spectacular spot and a favourite viewpoint of mine. We were watched by curious sheep as we hurried downhill behind the Wee White Dug, who was delighted to find himself on another walk. Mr G thought we were simply out for a walk, but I knew the bay was jam-packed with history. There were the remains of a Neolithic burial cairn, an old clan Campbell cemetery, with a couple of interesting 18th century gravestones AND a standing stone. Scant remains of a village emptied during the clearances also stood nearby, close to some derelict buildings from the sheep farm that saw them cruelly cast off the land. After my history geekfest we enjoyed a walk on the beach. The boy did some of his finest air sniffing and whimsical staring. We sniggered quietly as we snapped photos of him. We spotted a weird, lumpy brain looking thing on the beach (photo below). I’m not 100% sure what it is – so answers on a postcard please! Back at Ardtornish, we savoured the last of the daylight with a potter around the grounds and a nosey at the kitchen garden. For our spring visit I’m already thinking of pots of homemade soup with tasty, estate grown veg. We enjoyed another relaxing evening by the fire, and later in bed when the stag outside began to bellow neither of the boys responded! And so ended our wonderful autumn break on the Ardtornish Estate. I’d like to thank Kat for arranging our visit. Although we stayed on a complimentary basis, all opinions in this blog are entirely my own. I spent every May bank holiday on the Ardtornish estate as a child, such a magical place that I miss very dearly. Thanks for the wonderful post! So glad you enjoyed the blog. Those must have been wonderful childhood holidays. It’s such a brilliant place for children to explore. Stay tuned as I’ll be back with more from Ardtornish soon. It’s a brilliant initiative and lovely that it brings the excitement of a night at the cinema to remote communities. So cool! Would love to see it in action. Hahaha it’s not a roadtrip unless you take a wrong turn or there some waspy words between the two of you. I am guessing he got over it when he bagged half your brownie! Love a good autumnal yomp. Looks like you’re having a ball in Orkney. Glad you enjoyed your trip – it’s a beautiful area.